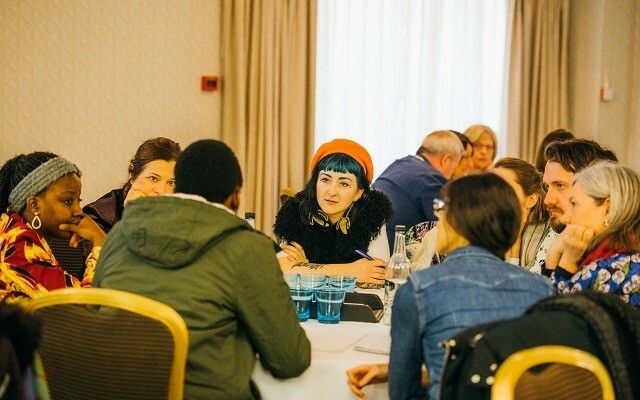 Last Thursday, NUS held its first Students and Alcohol conference for students' union and university staff and other sector stakeholders, in Leeds. 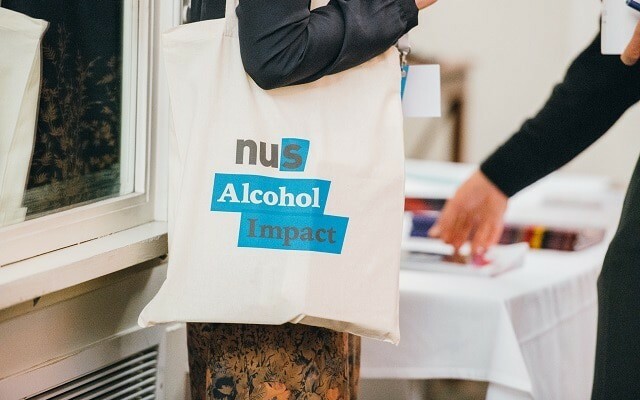 Over 100 delegates who work in the sphere of students and alcohol attended the conference, which was organised in tandem with NUS' Alcohol Impact. Alcohol Impact is a harm-reduction behaviour change programme, to support students' unions and universities in fostering productive, healthy and inclusive student cultures surrounding drinking. This conference was organised to enable collaboration and shared learning. The day began with a welcome from NUS Vice President for Welfare Izzy Lenga, who explained why reducing alcohol-related harm and building inclusive universities is so important to NUS. Delegates then heard from Leeds University Union's Welfare Officer Chloe Sparks. Chloe spoke about mental health and alcohol, and how Leeds' participation in Alcohol Impact has contributed to harm reduction and "a much more inclusive campus and union." Thanks to more alcohol-free spaces and other initiatives, she said "students now feel that the students' union isn't just a place for drinking and going out." Next up was Don Lavoie, Alcohol Programme Manager from the Public Health England National Team. Don highlighted the influence of drinking cultures on people's choices, and health impacts – proposing that the UK had particularly "normalised heavy drinking." Olivia Nuttall, Head of Alcohol Strategy and Policy at the Home Office, was also a keynote speaker. Olivia spoke about alcohol's relationship to violent crime, and shared government strategies such as a late-night levy – proceeds of which go into projects such as those to combat sexual harassment and to clean up streets. Delegates were offered twelve different workshops covering themes such as how storytelling can change cultures surrounding athletes' drinking habits, to learning about how the transition to university impacts relationships to alcohol. The 'Have a Word' workshop by Mandy Marlow, Assistant Head of Colleges at Durham University and Joanne Boyd, Training and Development Officer at Durham Drug and Alcohol Recovery Service looked at more – and less - effective measures for harm reduction. For example, giving students measuring cups and holistic support with mental health were discussed as highly effective strategies. Elsewhere, it was flagged that putting green, orange or red stickers on drinks – related to their alcohol content – had proven counterproductive, with some students seeing collecting red stickers on their arms as a matter of 'pride'! Another workshop, by Dr Kyle Brown, Senior Lecturer in Applied Psychology, Birmingham City University and Dr Emma L Davies, Senior Lecturer in Psychology, Oxford Brookes University, looked at creating alternatives to alcohol for university socialising - in particular, the concept of 'the sober rave'. Delegates discussed how this has worked in practice at their universities. For some, a daytime party including things like free yoga, food, drink and eco-friendly glitter – with great music – worked really well. At other universities, the events had an 'uncool' reputation with students, even coming across as 'patronising'. It was agreed that students' perspectives on what makes for positive alternatives to drinking-based events are crucial. Having good quality nights out was one idea to reduce binge drinking, as many students emphasise how they feel the need to drink heavily as some club nights are 'so bad'! In addition, there is the challenge of creating alternatives that make non-drinkers feel comfortable to transgress the social norm of drinking. An overarching feeling was that the value of nightlife, clubbing or raves should be acknowledged: these events, at their best, can build social cohesion, a sense of belonging, escape and altruism. How we meet these needs in ways that are accessible, reduce harm and boost wellbeing is the central challenge. At another workshop - about building interventions and initiatives with Alcohol Impact, by Kara Holloway, PhD student/Alcohol Impact officer at Keele University and Di Pedder, Head of Engagement and Support at Leeds University Union – a successful 'sober rave' was discussed. At Leeds Union, After Glow has proven "really, really popular." said Di. The event is advertised as being all about wellbeing, creativity and connection – and apparently the "good vibes" are really popular with students! The After Glow website says of the event: "The After Glow is not about promoting the t-total life. By removing alcohol, a social norm of socialising in the evening (think about the number of places that stay open late that don't serve alcohol? ), this creates space to question and look deeper, at ourselves and society." &amp;amp;amp;amp;amp;amp;amp;amp;amp;amp;amp;nbsp; Work at Leeds has also identified some valuable insights in relation to student drinking. For instance, an initial approach was to try to discourage 'pre-drinking' culture. However, upon further&amp;amp;amp;amp;amp;amp;amp;amp;amp;amp;amp;nbsp;research, it became clear that pre-drinking gatherings were often an important source of joy, social connection&amp;amp;amp;amp;amp;amp;amp;amp;amp;amp;amp;nbsp;and support for students – especially for women, who often looked out for those who were with them at pre-drinks, on the subsequent&amp;amp;amp;amp;amp;amp;amp;amp;amp;amp;amp;nbsp;night out. At&amp;amp;amp;amp;amp;amp;amp;amp;amp;amp;amp;nbsp;Keele, Alcohol Impact was credited with being part of an overall reduction in&amp;amp;amp;amp;amp;amp;amp;amp;amp;amp;amp;nbsp;hospitalisations&amp;amp;amp;amp;amp;amp;amp;amp;amp;amp;amp;nbsp;due to alcohol. One approach to this was by creating 'social norming' videos. &amp;amp;amp;amp;amp;amp;amp;amp;amp;lt;p&amp;amp;amp;amp;amp;amp;amp;amp;amp;gt;&amp;amp;amp;amp;amp;amp;amp;amp;amp;lt;iframe allow="autoplay; encrypted-media" allowfullscreen="" frameborder="0" height="400" src="https://www.youtube.com/embed/ndir7S1sXVY" width="640"&amp;amp;amp;amp;amp;amp;amp;amp;amp;gt; The NUS' first Students and Alcohol conference was a great opportunities for stakeholders to share approaches and learn from each other. Thank you to all who attended, and we hope to welcome&amp;amp;amp;amp;amp;amp;amp;amp;amp;amp;amp;nbsp;more institutions onto the Alcohol Impact&amp;amp;amp;amp;amp;amp;amp;amp;amp;amp;amp;nbsp;programme&amp;amp;amp;amp;amp;amp;amp;amp;amp;amp;amp;nbsp;in the coming months! Work at Leeds has also identified some valuable insights in relation to student drinking. For instance, an initial approach was to try to discourage 'pre-drinking' culture. However, upon further research, it became clear that pre-drinking gatherings were often an important source of joy, social connection and support for students – especially for women, who often looked out for those who were with them at pre-drinks on the subsequent night out. At Keele, Alcohol Impact was credited with being part of an overall reduction in hospitalisations due to alcohol. One approach to this was by creating 'social norming' videos. The NUS' first Students and Alcohol conference was a great opportunity for stakeholders to share approaches and learn from each other. Thank you to all who attended, and we hope to welcome more institutions onto the Alcohol Impact programme in the coming months! Presentations from the event can be found here.